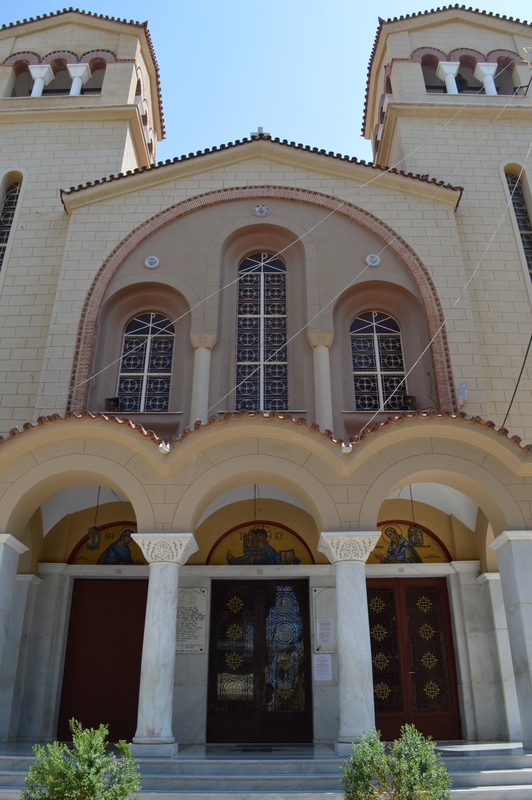 In a non-descript, lower middle class section outside the port of Pireaus stands the cathedral of St Efthimios of Keratsini. 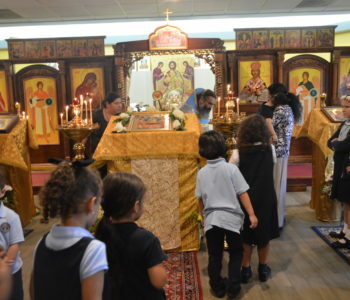 On first glance it appears like so many neighborhood churches, looming in its red clay Byzantine shingles and arched doorways, a large fixture that calls those in its reach to worship as faithfully as the clock strikes the hours in its bell tower. But a side door on its right side, an entryway that one can walk by and totally miss, leads to an underground level that is teeming with an army of volunteers. In its subterranean level a nest of worker ants is buzzing with activity all in the name of philanthropy. 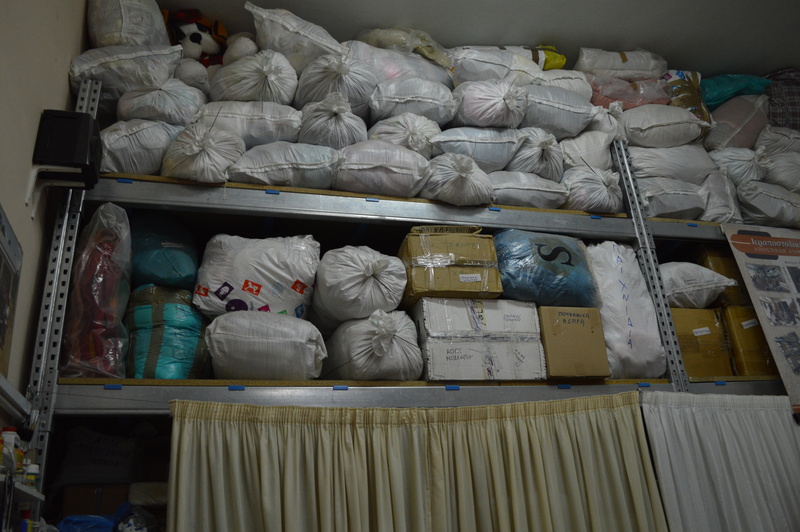 Sacks filled with clothes and provisions lie neatly stacked on huge industrial shelves; knick knacks line the gift shop, selling everything from icons to soap, donations from lay people, supermarket surplus, or the remaining inventory of shop owners whose business closed due to the crisis. On first impression the church and its mission exude organization, a rare commodity in a country stereotyped as lacking in that department. A drove of volunteers organize drop-offs daily bringing order out of chaos. Father Constantinos, one of the five parish priests, is in charge of the philanthropic mission. 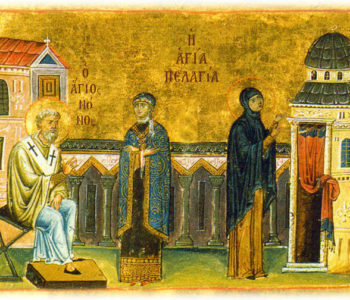 St Efthimios first started its missionary work by sending aid to India. Calcutta to be precise, where the Greek Orthodox Church ran an orphanage with 300 girls (the documentary “Tears of Love” by Christiana Thanos publicized the site). However, after the state of India refused to renew the visas of all missionaries to its lands, the philanthropic efforts were channeled to Madagascar, according the UN estimates, the poorest nation in sub-Saharan Africa. This occurred around the time when the fateful helicopter journeying close to Mt Athos that bore the Patriarch of Alexandria and the Archbishop of Madagascar exploded. This prompted the Patriarch to send the young Father Ignatios to expand the small mission in Madagascar in 2004. 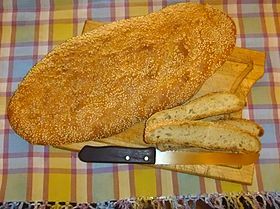 The headquarters for the relief has concentrated in St Efthimios’ four large warehouses since that time. The Mission in Madagascar is a bustling reflection of the church’s efforts in Keratsini. 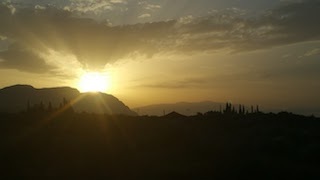 Each year teams of volunteers visit the compound and help with construction, education, health care, theological training to some of the most impoverished peoples, mostly in the bush and far country, away from the main city. 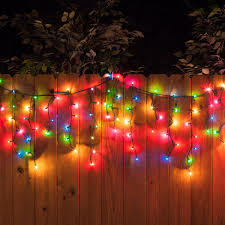 For example, every year a 6-member team from Cyprus including two internists, two dentists, and two pediatricians, run a 20-day healthcare program, visiting remote villages around the country, providing locals with the only visit they will get to a licensed healthcare provider the entire year. The mission not only runs an orphanage that takes in many out-of-wedlock babies through an chute door by its side, but has established a woodworking factory, an iron works shop along with aluminum welding factory. Most of the wood and iron supplies are shipped by containers from Pireaus every year as the local materials are quite expensive and of inferior quality. In this way the Mission has developed a nucleus of construction to build more needed buildings such as adequate houses for villagers, school houses, and health centers. The containers sent over by the work of volunteers from Keratsini have included cars, tractor trailers, medical equipment such as X-ray machines, wood beams, iron joists and steel pillars necessary for construction, in addition to food, clothing, school supplies, hardware, household appliances. The Mission sends from 2-3 containers annually, this year marking their 17th container to one of the most remote destinations in the world. The volunteers in Madagascar include people from a broad spectrum of life: nurses, teachers, carpenters, lawyers, priests, theologians, social workers, etc. 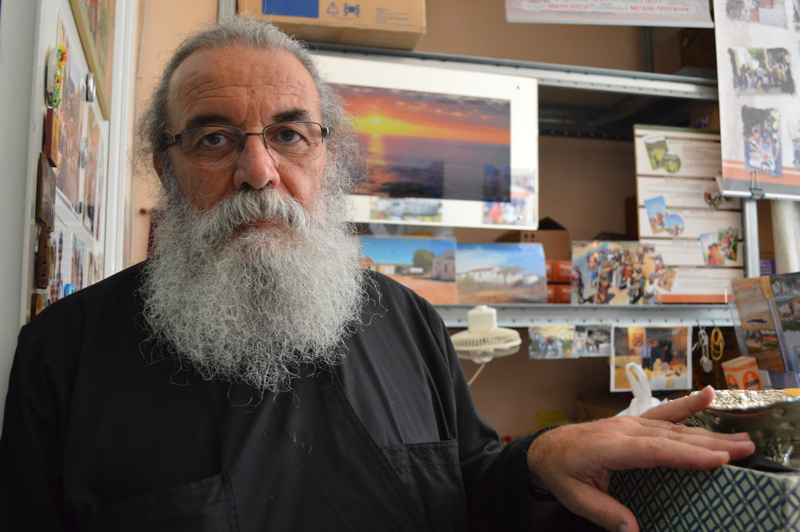 “We accept volunteers who are willing to work and not just tourists who want to use the mission as a base to go on holiday,” Father Constantinos explains. He asks that volunteers be willing to dedicate two months out of their lives to help. The Mission can accommodate up to 20 volunteers at one time as there are only so many seats on the jeeps to take them into the back country each day. He prefers that those thinking of volunteering to email their intentions first, go through a short Skype interview with himself or Bishop Ignatios, before they can get definitive approval. Because the summer months of July and August are high season for the volunteer supply chain, the Fathers would prefer to engage those willing to serve throughout the year, especially in the winter (when thanks to the equatorial flip they would enjoy hot summer weather instead of the Northern European or American cold). 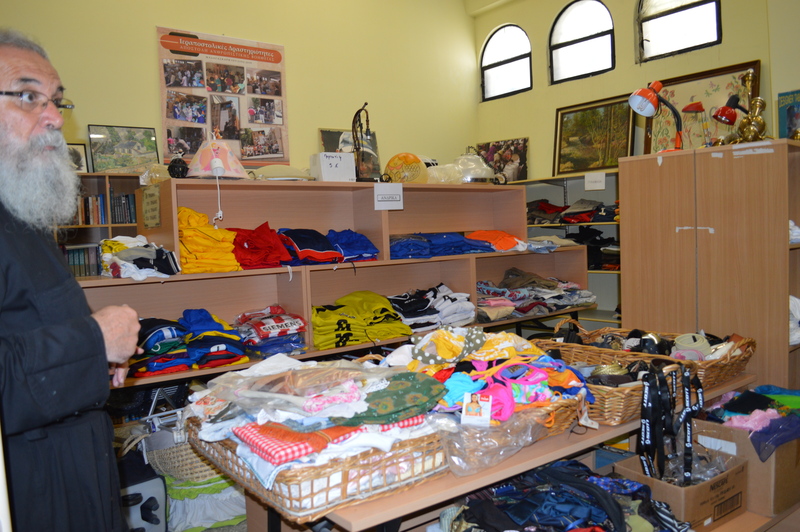 To generate revenue to support the Mission in Madagascar, St. Efthimios runs a thrift store. A team of volunteers sort and sift through bags and bags of donations, separating them into what is usable and not. These goods are distributed along with food and other necessities into burlap sacks that serve as care packages, each designated for a specific family in Madagascar. 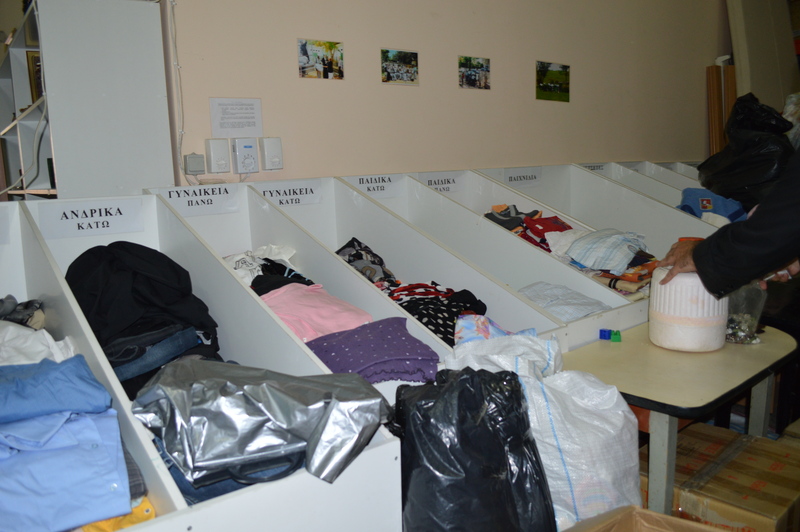 Volunteers sort out clothing into what is usable and what is not and place in cubbies. 150 volunteers take part in the Mission’s efforts. 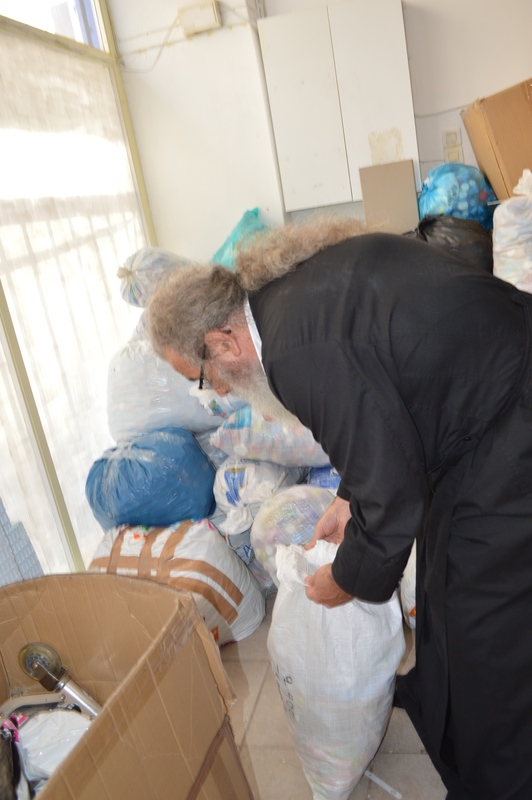 The church also organizes fundraisers, but while other charities hold holiday fundraisers mostly around the Christmas or Easter holidays, the mission in Keratsini holds one every week. Word has gone out to the greater community, so that the needy in Athens and the surrounding suburbs can visit the shop for reduced prices on goods year-round. Neatly folded slightly used sweaters are stacked on shelves; slightly-used jeans can be had for 2 Euros as opposed to 25 in the going market. 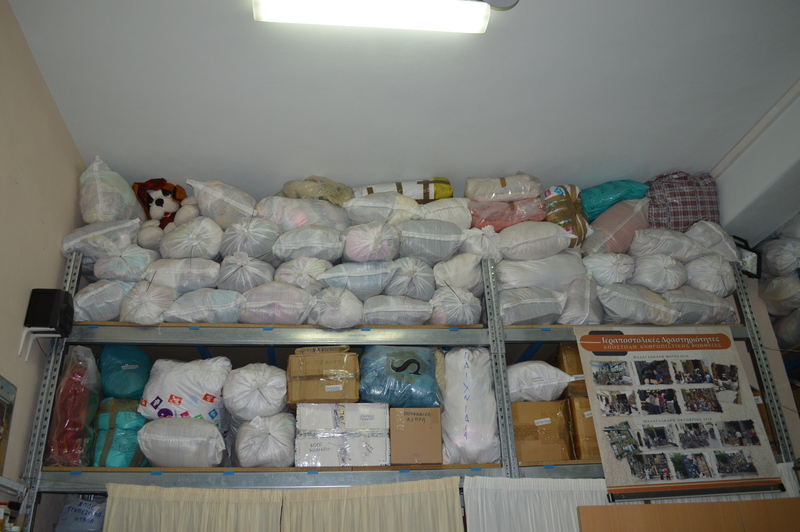 Everything from toys to baby supplies, feeding chairs, books, furniture, shoes, school supplies, hardware, light bulbs, lamps, paintings and decor–everything for the home can be purchased for under 5 Euros. 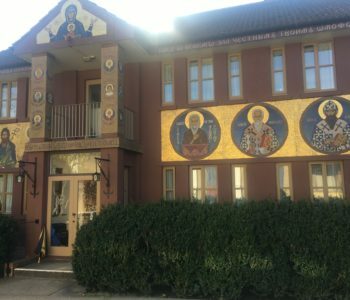 Dimitra Pallis, the social media volunteer who has worked at the Mission for 34 years, states that St. Efthimios has become a model of philanthropic logistics for other churches to replicate. 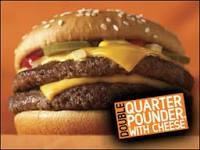 It started before the crisis tending to the needs of 60 parish families but now serves 260. A retired teacher, Pallis devotes herself full-time to the mission. “I am working harder now then when I did in the job field,” she admits. During her interview, she was organizing the weekly food distribution for the needy and the unemployed on register: neatly packaged groceries in orange plastic Sklavenitis bags, just as you would find in a regular supermarket. She points to a young couple who dropped in to pick up their weekly rations. The Church runs a tight ship. While it never turns away those who ask for help–providing free food, free clothing, free housewares–it does follow a thorough screening process. Families fill out forma and undergo a thorough background check to verify need. Visits to the shop operate by strict appointment schedule. This way much of the double-dipping from government aid that might happen is reduced. A team inspects documents and double-checks them against welfare lists; even house visits are arranged to verify the need. 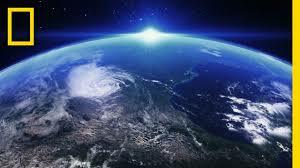 And donations are not distributed willy-nilly; they are checked against need, size, and quota. 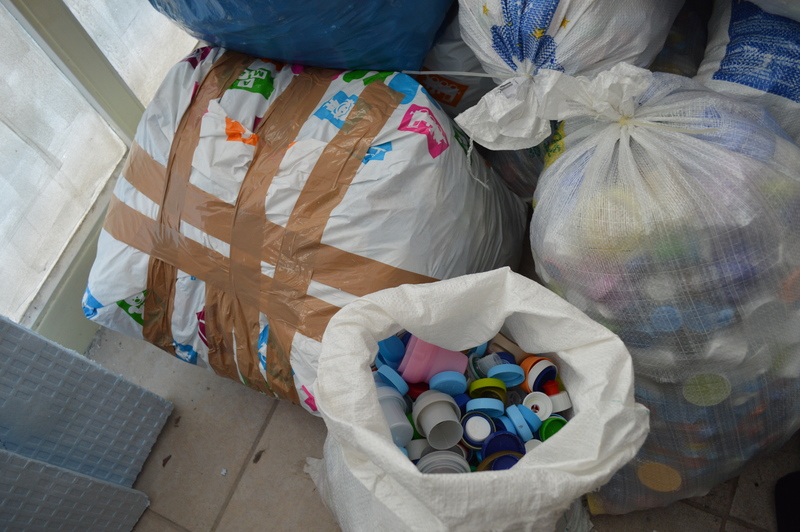 One of the most innovative recycling efforts of the Mission involves school children collecting plastic bottle caps. One and a half ton of plastic caps are collected and brought to recycling facilities. Its most notable campaign involves the collection of the plastic bottle caps on the UHT cartons for milk, juice, and soft drinks, even detergent and fabric softener containers. Schoolchildren in the local area make an effort to collect these and bring them to school. One child can bring from 15 to 20 per day; with 500 children in a school, an average of 10,00 can be collected per day, amounting to 50,000 per week. Every week the church makes pick ups of these caps and after a ton and a half have accumulated, they pass it on to the local plastic recycling plant. To date, the Million Cap Campaign has spread though the local public schools so that it has become a common habit among the children. 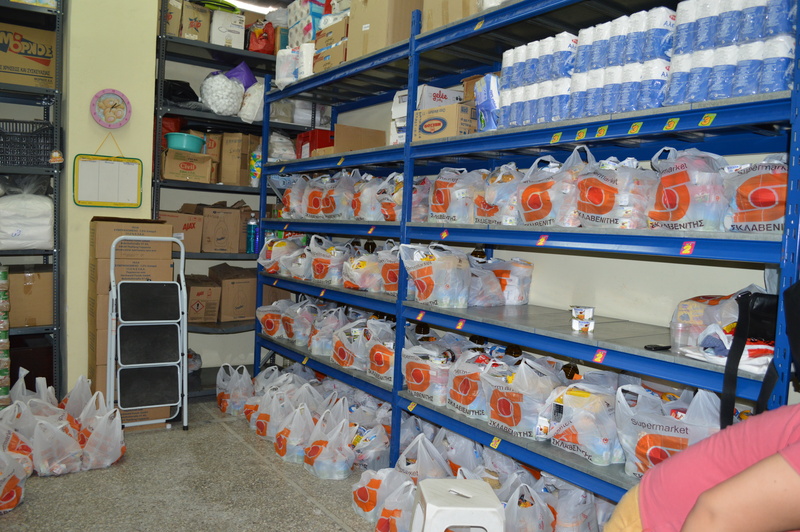 The Mission keeps storage of long-term food stuffs such as UHT milk, water, sugar, flour. 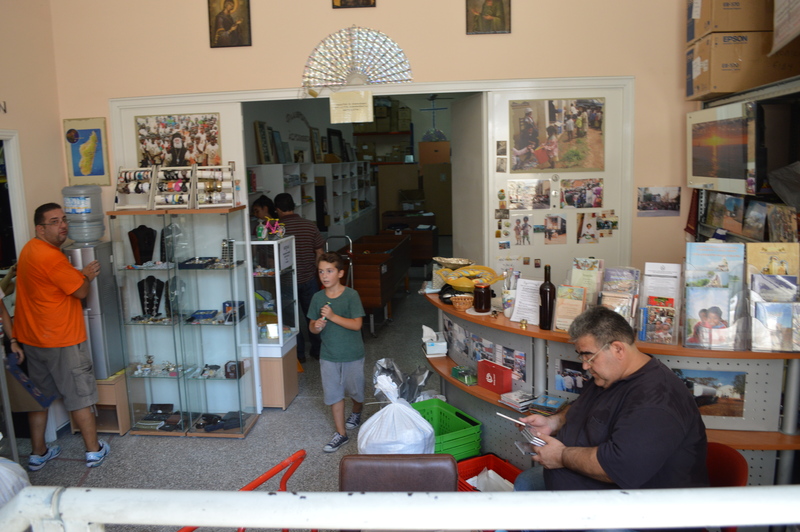 Another room in the thrift store that helps both needy Greeks purchase goods at reduced prices and needy Africans receive needed supplies–a double do-good.